So I’ve finally received the audiobook and I’m, so excited (geek me loves books and reading) … check it out and I’ll keep you posted on what I learn … YAY ! 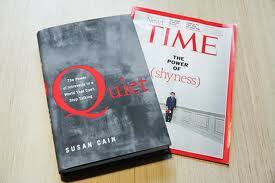 “At least one-third of the people we know are introverts. They are the ones who prefer listening to speaking, reading to partying; who innovate and create but dislike self-promotion; who favor working on their own over brainstorming in teams. Although they are often labeled “quiet,” it is to introverts that we owe many of the great contributions to society–from van Gogh’s sunflowers to the invention of the personal computer. This extraordinary book has the power to permanently change how we see introverts and, equally important, how introverts see themselves”. I’m waiting for your review then, I can feel your excitement already! Have a lovely day! This book is in my shopping list.